I’m On Sale, Are You? How well do you know your boss? Does he pal around with you after work? Do you eat lunch with her regularly? Do you know what kind of car he drives, or her favorite food? Do you know how many kids he has or what her only daughter’s name is? Do you know who her favorite sports team is? Do you know what side of town he lives on? Let’s pretend you’re a door to door salesman for a second. You’ve been working the same route for years and you know your customers in and out. For example, you know the Mrs. Johnson down the street was devastated last year when her prize winning roses were ruined by a stray dog. You know that Mr. Jones is a single dad whose son Andrew is about to leave for college. You know enough about the people on your beat that you could strike up a conversation with any of them right on the spot. You’re no dummy. You learned long ago that the hardest part of selling was getting your foot in the door. You realized that a person who had personal conversation with you was more likely to remember you, like you and buy from you, both now and in the future. In fact, you can remember a couple of years back when a new salesman was selling a competing product on your beat. Even though his product was a little better than yours he found he had a hard time selling it. You can still remember the way you felt when Ms. Jackson told you that she would only buy from you, no matter who came around. But that’s just make believe right? After all, you’re not really a salesman. 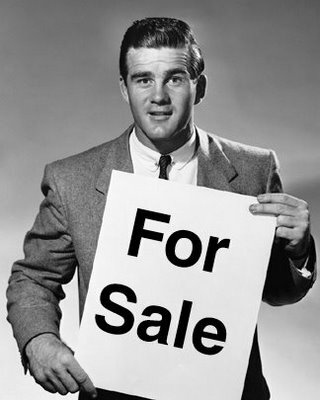 If you are working in corporate America then you’re a salesman or saleswoman even if you don’t know it. You’re selling a brand with your name on it. Your boss is your customer. The more that this customer does business with you the more opportunities you’ll have to develop, prove your worth and elevate yourself above your peers. There are only a few ways to bring customers your way and you’re already familiar with all of them. You can be like Wal-Mart and churn out the most work in the shortest amount of time, even though it’s of questionable quality. You could be like Whole Foods and establish a niche for yourself that brings people your way for a particular specialty. You can even be Publix and attract your customers with the quality of your work. The thing is, none of those things are permanent. The way to attract customers your way permanently is to build a relationship with them. Talk to them. Learn who they are, what’s happening in their life, what makes them tick. When you’ve built a relationship with your manager you’ve accomplished so many things. You’ve developed a key skill that will serve you more and more as you grow in your organization. You’ve put yourself in a better position if there are layoffs in your department. You’ve put yourself in line for better reviews and better raises. But Jonathan, isn’t that kissing up? No it isn’t. Kissing up is when you act this way to gain favor without solid work and effort to back it up. That’s not what you’re doing. You’re working hard. You’re putting in the time and doing your best to do a great job. What you’re doing is relationship building. Relationship building is actually one of the more important competencies that businesses want you to develop. As you move up in the organization you will find that your ability to build relationships is one of the key determinants in your ability to get things accomplished. But I don’t like my boss! Did anybody ask you if you liked your boss? I believe it was the famous philosopher Tina Turner who asked what love had to do with it. Are you going to let your emotions stall your career and make your life harder? I hope not, that is exactly the kind of thing that managers will use to weed you out when they are talking about high performers. In fact, if your relationship with your manager is on the rocks then you have a great chance to show how mature you are by letting it go and doing your best for them. Yes! The ability to be a bigger person, to move past issues and not let emotions get in the way of business is a skill that managers want to see. More importantly, you can’t afford to have a bad relationship with your manager. If they aren’t the type to smooth things over then it’s going to be up to you to step up and work through it. But my boss is scary/intimidating etc. Poppycock! I’ve probably mentioned this in every post so far, your boss is human. They are just like you. Do they keep their head down in the hallway and not say hello? Guess what, they are shy! Always remember that your boss is a person. They are the star of their own life, just like you are. They will respond positively if you show interest in them. Remember what your parents taught you? To get a friend you have to be a friend. It’s time to be your boss’s friend. And I don’t mean the kind of friend who laughs at jokes that aren’t funny and agrees with everything kind of friend either. I mean a real friend, someone who’s interested in another person’s life and shares some of their own. Build that relationship and your boss will be your customer forever. And just like any good customer, they will recommend you to their friends and peers. Posted on November 23, 2010, in Career Development and tagged boss, business, Customer, Relationship, sale. Bookmark the permalink. 3 Comments. As with so much of what you have written so far, the employee must be willing to do some daily self-checking. There seems to be a fine line in this and one that some bosses may not be willing to cross. There is a high risk an employee may try to be a “brand” by rote and expecting, like the formula for the perimeter of a rectangle, once you plug the numbers in, the result is predictable. If you are expecting a promotion/recommendation because you pushed all the right buttons, then you really need to evaluate your relationship to your job. Are you doing things to get ahead or because they are the moral thing to do? I know you, Jonathan, well enough to know to read between the lines to see the underpinnings of this essay. I also know that you are just getting started and your topics will go deep and wide. I just wonder if this one needs to go a tad bit deeper. Thanks for checking in Waco. You bring up a valid point here but I think you may give me too much credit. I think it’s highly unlikely that anyone will read these articles and do a complete about face to copy the things that are found within. My hope is those who read these articles consider their words and maybe, just maybe, take a step or two in the direction that I’m suggesting. I think we’ve talking about a few steps on a mile long course. That being said, as I’ve started putting these articles together I have intentionally started to avoid all of the caveats and detailed explanations of when you should and should not take a specific action. There are a couple of reasons for this. First, all of those caveats are mind-numbing both to the readers and to the poor writer. Secondly, when all of the official caveats are included it makes the case change much less compelling, and as a result it will usually leave a person right where they started. From my point of view. I hope that my thoughts will help you think about things in a new way and hopefully an action or two. But as you say, it is up to each person to discern and act on their own situation. Removing the caveats: I think I get that. As we have talked about this, I believe you are hoping to provide a rationale for action as opposed to playing the victim. Better to move towards something than away from something else…. At any rate, your next in this series seems to hit upon the idea of a personal self-check by examining a self purpose.